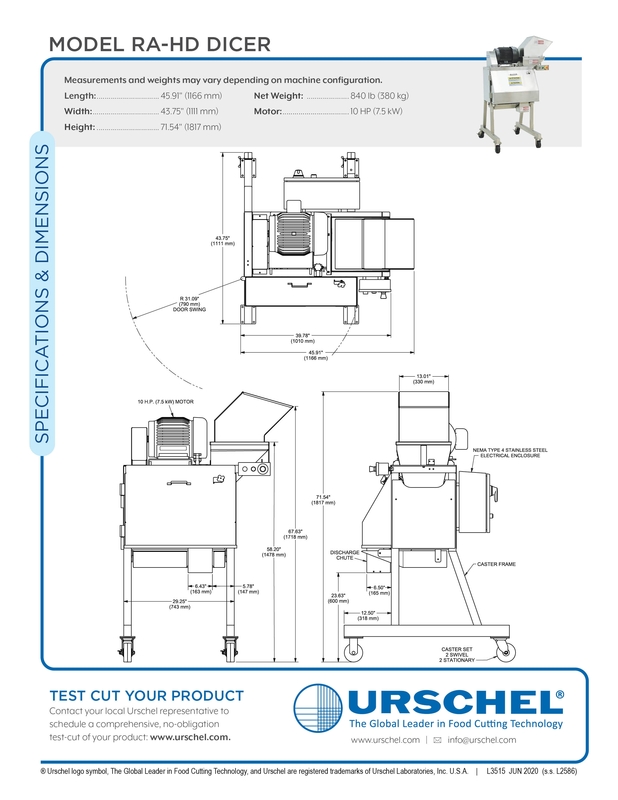 Model RA-HD Dicer - Urschel Laboratories, Inc. Produces a variety of small to intermediate size dices and strip cuts. Maximum infeed size of 3.5" (88.9 mm) in any dimension. Equipped with stainless steel product contact parts. Heavy duty hybrid version of the Models RA-A and RA-D. Uses many existing parts from the RA-A and the RA-D combined with a large 10 horsepower motor, a new heavy duty drive configuration. and associated components to promote load distribution absorption and reduce load stress. Features continuous operation for uninterrupted production and simplified design for easy cleanup and maintenance. The new Model RA-HD is a heavy duty hybrid version of the Models RA-A and RA-D. The RA-HD uses many existing parts from both machines. These parts are combined with a larger motor, a new heavy duty drive configuration, and associated components to promote load distribution absorption and reduce load stress. The new outboard bearing reinforces the drive components to allow increased feed rates. Additional features include a hinged access panel with a delayed access knob to ease sanitation and maintenance. 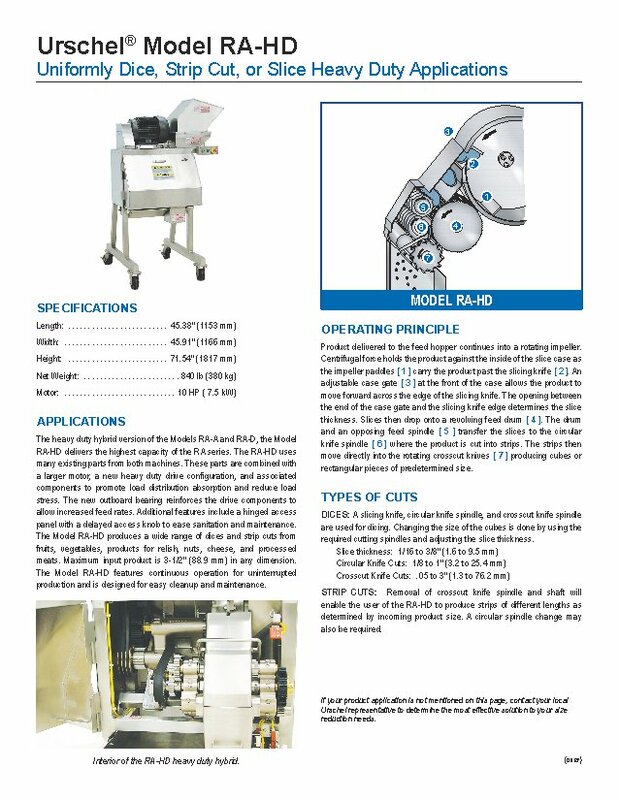 The Model RA-HD produces a wide range of dices and strip cuts from fruits, vegetables, products for relish, nuts, cheese, and processed meats. Maximum input product is 3-1/2" (88.9 mm) in any dimension. 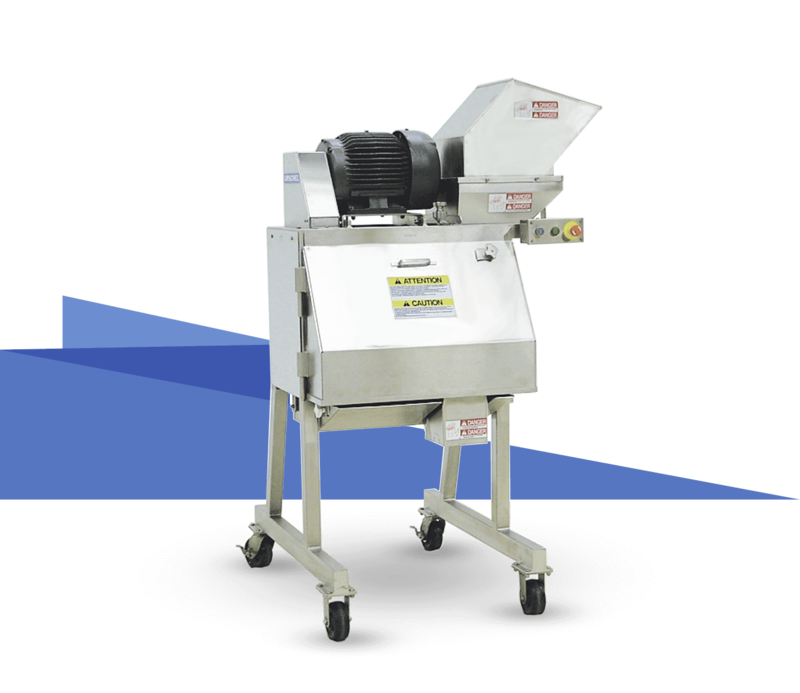 The Model RA-HD features continuous operation for uninterrupted production and simplified design for easy cleanup and maintenance. carry the product past the slicing knife [ 2 ]. An adjustable case gate [ 3 ] at the front of the case allows the product to move forward across the edge of the slicing knife. The opening between the end of the case gate and the slicing knife edge determines the slice thickness. Slices then drop onto a revolving feed drum [ 4 ]. to the circular knife spindle [ 6 ] where the product is cut into strips. The strips then move directly into the rotating crosscut knives [ 7 ] producing cubes or rectangular pieces of predetermined size. A slicing knife, circular knife spindle, and crosscut knife spindle are used for dicing. Changing the size of the cubes is done by using the required cutting spindles and adjusting the slice thickness. 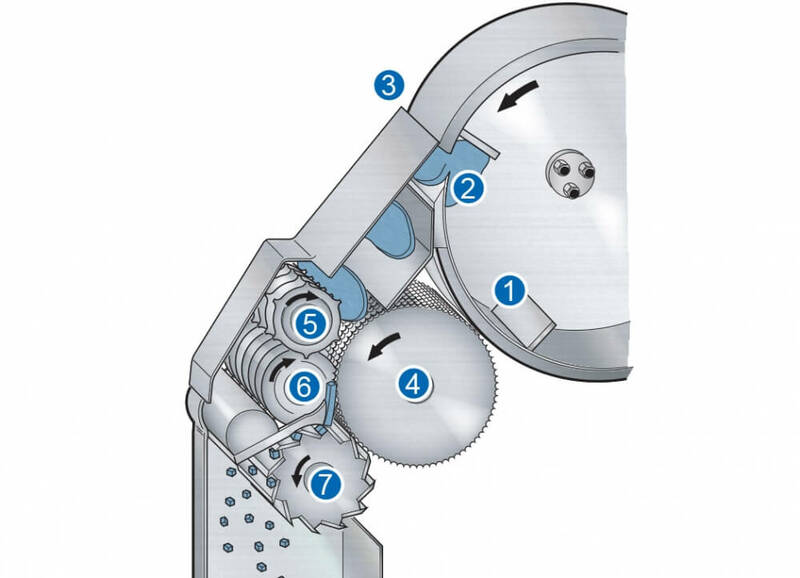 Removal of crosscut knife spindle and shaft will enable the user of the RA-HD to produce strips of different lengths as determined by incoming product size. A circular spindle change may also be required.